The Sugar Overload Season is upon us. So help me to help you. 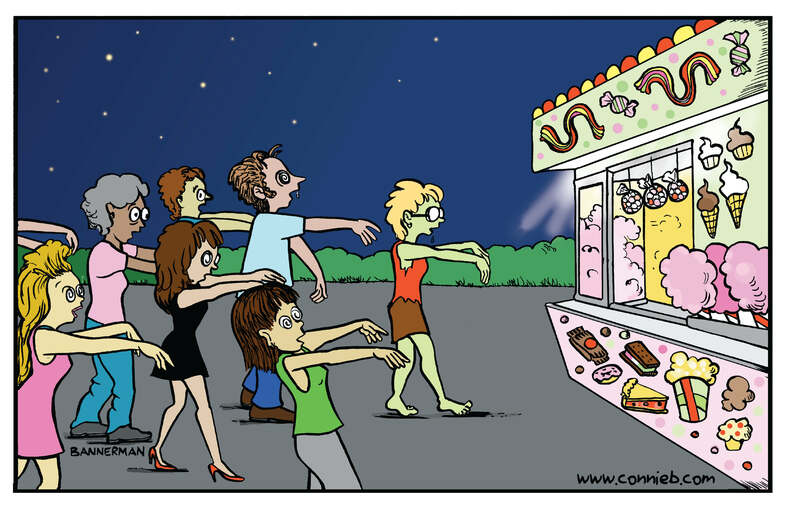 Don’t be a mindless Sugar Zombie this holiday season. This year, I’m determined to help you easily, quickly, even happily turn down those dangerous, sweet temptations. Soon, I’ll share some simple ways to Say No with Sass or Class. Submit your best quips, replies, reactions to those inevitable Sugar Pushers so you won’t be a Sugar Zombie this holiday season. Make sure to sign up for my mailing list so you’ll get a copy of these Say No with Sass and Class. You know how drunk people stagger, lose coordination, and get mentally confused? Well, if you’d seen me earlier this week, you might have assumed I was sloshed on booze. But I wasn’t recovering from alcohol overuse. Instead, recently, I had a horrible Sugar Hangover. And I felt utterly a-w-f-u-l! What irks and embarrasses me is that I ate sugar by mistake. Because I know better, it should have been easy for me to avoid. 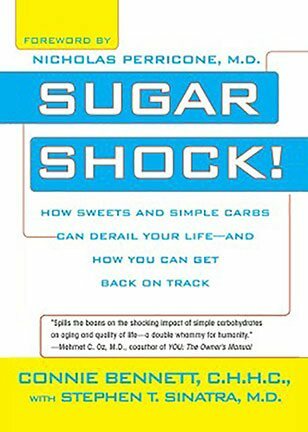 For those of you who haven’t heard my story, I’ve been sugar-free since the spring of 1998, when I quit all sweets and processed carbohydrates on doctor’s orders. Now, 17 years later, that’s why staying off sugar and quickie carbs is so important to me. I feel awesome when I’m sugar-free. Eating cleanly makes me energetic, focused, and puts me at the top of my game. But I feel horrible if I partake of any sweeteners. Although I haven’t been totally perfect—I slipped a few times early on in my sugar sobriety—I’m always diligent about reading food labels and quizzing waiters so I can avoid all hidden sugars. But, recently, I let my guard down and inadvertently ingested the sweet stuff. Here’s what happened a few days ago, while I was at the movie theater. My accidental Sugar Poisoning was my own darn fault. I know how important it is to always, always, always read food labels very, very, very carefully, —even if a food is allegedly “healthy.” That way I can identity any hidden sugars. Talk to us. Will you join me in making a donation to the Hypoglycemia Support Foundation? I hope you had a wonderful, grateful Thanksgiving. On Cyber Monday — or any day, for that matter — I invite you to make a donation to a worthwhile organization while you buy your holiday gifts. In fact, i invite you to join me in donating to the worthwhile, non-profit Hypoglycemia Support Foundation. Why am I encouraging you to donate to the Hypoglycemia Support Foundation? Because this organization does amazing work to educate people about hypoglycemia or low blood sugar. This is a condition, which can manifest some 125 symptoms, including headaches, mood swings, heart palpitations, mental confusion (brain fog), excessive fatigue, anxiety, brain fog, cold hands and feet, and Crazy Sugar Cravings. I personally have greatly benefited from the Hypoglyemia Support Foundation. In fact, back in 1998, when I learned that I had hypolgycemia or low blood sugar, Roberta Ruggiero, founder and president of the Hypoglycemia Support Foundation, helped me so much! Indeed, thanks to Roberta’s unwavering support, encouragement, and patient explanations, I was able to follow my doctor’s orders to kick sweets and quickie carbs, to take back my health and to say farewell to 44 baffling ailments. You’ve never met a woman more dedicated than Robera, who has been steadfastly dedicated for 34 ears to help people learn about hypoglycemia, which has been dubbed the “Great Imitator,” because people with this condition can manifest ailments that confuse medical professionals. Did you know, for instance, that if you have hypoglycemia, your doctor can wrongly diagnose you for bipolar disorder, schizophrenia, neurosis, migraines, Parkinson’s syndrome, chronic bronchial asthma, paroxysmal tachycardia (rapid heartbeat), rheematoid arthritis, cerebral arteriosclerosis (hardening of the brain’s arteries), menopause, mental retardation, alcoholism, hyperactive disorder, and even senility. 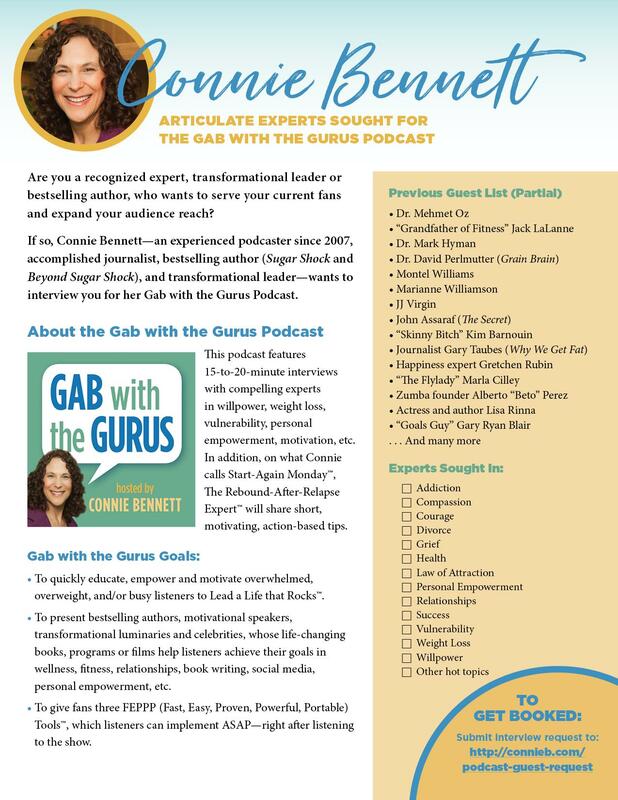 To learn more about the Hypoglycemia Support Foundation and its founder Roberta Ruggiero, listen to last year’s Gab with the Gurus Show, when I interviewed Roberta for my 15 years off sugar celebration. In this show, we share secrets to staying sugar-free. Do you often feel wiped out, weak, dizzy, forgetful, irritable or depressed? Or, do you struggle with insomnia, headaches, obesity, anxiety, brain fog or heart palpitations? And are you hounded by what I call Crazy Cravings™ and sudden, ravenous hunger? Your doctor could be completely wrong! Instead, you could be among millions, who have click here hypoglycemia or low blood sugar. Hypolgycemia is an often-overlooked, debilitating medical condition, which means that your blood glucose drops too low for you to be able to go about your daily activities. When your blood sugar plunges, you can get hit by dizziness, fatigue, headaches, mood swings, forgetfulness, brain fog, heart palpitations and dozens of other ailments. Low blood sugar is the reverse of diabetes, which generally gets the most attention, but in my opinion, according to my extensive research, hypoglycemia is far more pervasive. In fact, my research leads me to believe that about half of the people in the United States and millions more around the world have this condition — yes, it’s not a disease. So what’s the cure for hypoglycemia? Yes, to manage your low blood sugar, you don’t need to take any medication. You just need to cut out candies, cookies, cakes, breads, pasta, candies and other fast-acting carbohydrates, which I call carb crap. At the time, my savvy physician’s unusual prescription was unsettling. more info “Quit sugar and processed carbohydrates,” my doctor ordered. Letting go of my favorite sweet treats was the last thing I wanted to do! And it was no easy feat. Roberta — who has had her share of low blood sugar woes — is president of the non-profit Hypoglycemia Support Foundation, which she founded in 1980 to educate and support millions worldwide on how to prevent and manage their low blood sugar, came to my rescue. This week, Roberta and her amazing organization are celebrating 34 years of serving desperate people worldwide. I cannot overstate how grateful I am to Roberta for helping me to kick sweets and quickie carbs and to learn about hypoglycemia. Given that I first contacted Roberta in 1998 — well before the Internet was easy to access — I had to rely on books and Roberta for my hypo education. Wow, did Roberta come through for me! For instance, Roberta — whose phone number I tracked down — patiently explained to me that our bodies, and especially our brains, need glucose to survive. That’s because low blood sugar’s strange, startling symptoms — some experts cite asm many as 125 of them — can make your doctor wrongly believe that you have bipolar disorder, schizophrenia, neurosis, mibgraines, Parkinson’s syndrome, chronic bronchial asthma, paroxysmal tachycardia (rapid heartbeat), rehematoid arthritis, cerebral arteriosclerosis (hardening of the brain’s arteries), menopause, mental retardation, alcoholism, hyperactive disorder, and even senility. 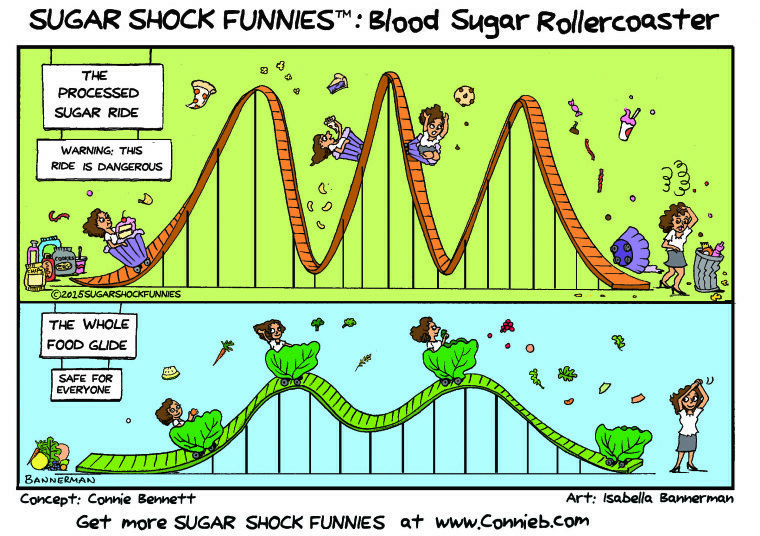 In short, when you have hypoglycemia — which I dub “hypo” — you and your doctor can get mighty confused. As I was getting better, I then heard Roberta’s startling story. In fact, both she and many doctors over the years were completely baffled as to what was wrong with her. She was even subjected to grueling electroshock treatments when all she needed to do was quit sugar! I invite you now to listen to my interview with Roberta Ruggiero on my Gab with the Gurus Show. The interview took place last year when while I was celebrating 15 years off sugar. Anyhow, again, thanks to to the amazing Roberta Ruggiero, for helping me to successfully quit sugar and refined carbs back in 1998. In fact, I’m only here today helping people worldwide to break free of their sugar addiction and Sugar Shock because of Roberta. Again, I invite you to listen now to last year’s interview with Roberta on my Gab with the Gurus Show. I also urge you to learn more about Roberta and her valuable Hypoglycemia Support Foundation. Fan the HSF on Facebook. A very special thanks to Craig Cameron for the artwork above. Join the Conversation: Have you had a diet relapse? If you like, share when and why, too. Have you broken your diet? Have your circumstances — whehter due to to hearbreak, stress, trauma or grief — led you to ditch your resolve to eat eat cleanly so you can shed your dreaded excess weight? Now that you’ve blown your diet, are you beating yourself up now for letting yourself go and mindlessly shoveling in unhealthy, sugary, fatty or salty unreal foods? Please take a brief time out. It’s time to hit the pause button. Beating up on yourself after you blow your diet won’t make your life or your body better. Instead, at this time, the first step you want to take to Get Back on Track is to Shower Yourself with Compassion. Yes, it’s time to cut yourself lots of slack. Yes, you blew your diet. Yes, you gained weight. But probably had some darn good reasons for falling off the diet wagon. It’s imperative to give yourself compassion after you blow your diet. A year and a half ago, I learned a lot about the power and health ramifications of mindfully giving yourself loving-kindness, acceptance, empathy, and compassion after you blow your diet or do anything else self-destructive or counter productive. You see, I needed to become compassionate myself, because I, too, had blown my clean way of eating. You can read My Carb Confession here, where I reveal that I had a major relapse while healing from My Bittersweet Last Year with Mom. At the time, after gaining 20 extra pounds, I was absolutely mortified. I even hid out, especially from fellow health experts, because it was agonizingly difficult to admit that I’d fallen off the wagon since Ii’m a recognized sugar and carb expert, who has eating cleanly since 1998 (well, for the most part). You reduce your anxiiety, depression, stress, desire for perfectionism, body shame, and fear of failure. You also increase your life satisfaction, happiness, self-confidence, optimism, curiosity, creativity, and gratitude. If you’ve blown your diet or are beating up on yourself for other self-destructive behaviior, I highly recommend that you check out Dr. Neff’s book, Self-Compassion: The Proven Power of Being Kind to Yourself. Stay tuned for more tips and tactics to help you Rebound After Relapse. 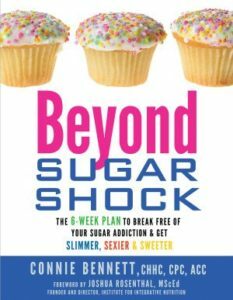 About Connie: Since 1998, after kicking sugar and fast carbs on doctor’s orders and bidding 44 ailments farewell, Connie Bennett achieved acclaim as a health expert, Sweet Freedom Coach and author of the bestselling books, Sugar Shock and Beyond Sugar Shock. But in 2012, after the grueling, year-long traumatic terminal illness and subsequent death of her mother, Connie did massive Heartbreak Carb Bingeing™. The upshot? She gained 21 pounds. Oops! Now, Connie’s back to help you, too, Rebound After Relapse™. Sign up for Connie’s mailing list to get tips so you can Bounce Back After Relapse™. And stay tuned for Connie’s upcoming book and companion program. Note from Connie: Today, it’s my pleasuret to present a guest post from my colleague Yuri Elkaim, author of the new book, The All-Day Energy Diet. Join Yuri and me tomorrow, when he joins my Gab with the Gurus Show to tell you how to get more consistent, steady energy. Remember, as with all of my shows, you can listen live or later. If you’re tired most of the time, then it means your body is crying for help. Low energy is a warning sign that something inside your body isn’t quite right. Considering the amount of sickness and “overweightness” that has now engulfed our world, it’s no surprise that more and more, people are feeling exhausted. What’s important for you to know is that when you improve your energy, you improve your health. Thankfully, the answer to that question is easy to answer. And it has nothing to do with shots of espresso or sugar-filled treats. The secret to fatigue-proofing your body (and raising your overall level of health) boils down to optimizing what’s going on inside your body. Each of us is at war, and we don’t even know it. The private war we each wage is a daily assault on our body by acid-forming foods such as alcohol, animal products, and refined sugars, as well as by bacteria, virus, fungus, yeasts, and molds. We have entered what might be referred to as critical mass when it comes to this onslaught being waged against us by stronger and stronger killer bugs and poorer and poorer food choices. Our immune systems are becoming weaker and over-taxed in this war. Even the medical profession’s first line of defense, the antibiotic, is becoming less and less effective against resistant new strains being created daily as the bacteria mutate. The environment referred to in Dr. Pasteur’s statement is known as our biological terrain and refers to the health of our “internal” environment. A major determinant of our internal health is the acid-alkaline balance within many of our body’s fluids, namely our blood. Our blood is alkaline by design and acid by function – meaning that it produces acid as a function of metabolism. Maintaining proper alkalinity is therefore essential for life, health, and vitality. Under ideal alkaline conditions, the red blood cells (RBCs) within our blood are able to deliver energy-producing oxygen to our cells. However, an imbalance of alkalinity creates a condition whereby our RBCs begin to clump together, making it more difficult for them to reach their ultimate destination and drop off that much needed oxygen to our cells. And if your blood is sluggish, you will be, too. Leading biochemists and medical physiologists have recognized pH (or the acid-alkaline balance) as the most important aspect of a healthy (and energized) body. They have long known that the maintenance of an alkaline pH in the tissues and cells is critical to our health. For instance, Dr. Linus Pauling, two-time Nobel Prize recipient, was the first to show that cancer cells cannot grow in alkaline environments. Unfortunately, for most people, current lifestyle habits have created highly acidic bodies. The standard western diet is characterized by an overindulgence of all types of foods and drinks that disrupt our blood’s ideal pH balance. As a result, we feel less than ideal as we go through our days. Eat and drink more greens. Green vegetables are the greatest source of alkaline minerals like calcium, magnesium, and potassium, and they deposit a large alkaline load in the body. They are pure energy, and they also give your body tremendous amounts of vital nutrients. The easiest way to benefit from their powers is to enjoy a fresh-pressed green juice or homemade smoothie at least once per day. Limit your caffeine consumption. I know this might be tough, but caffeine is a huge contributor of acid and provides unnecessary stimulation in your body. Other than the quick “artificial jolt” that it produces, chronic reliance on this stimulant taxes your adrenal glands (which are needed to help you cope with stress) and wreaks havoc on your blood sugar levels, both of which affect how you feel throughout the day. Start your day with a glass of freshly squeezed lemon water. Lemon, although acid in nature, is alkaline-forming inside the body. It is also highly beneficial for cleansing your liver, the organ responsible for filtering toxins that circulate in the body. Happy liver, happy body. Apply these simple steps and you’ll be well on your way to having more energy from the time you wake up until you call it a day. Combine sprouts and tomatoes in a bowl. Whisk all other ingredients together. Combine vinaigrette with sprout mixture and serve. Note from Connie: Remember to catch Yuri this week when he comes on my Gab with the Gurus Show to tell you how to get more consistent, steady energy. (As with all my Gab with the Gurus Shows, you can listen live or later. Even if you’re one mindless eater, there’s hope for you yet..
It’s my honor to be included in the Mindful Eating Summit, which is presented this week by my friend and colleague, Susan Albers, Psy.D, author of Eating Mindfully and a Cleveland Clinic psychologist. For this amazing Mindful Eating Summit, Dr. Albers has interviewed 20 of the world’s top leading eating experts, who share information that you won’t hear anywhere else. In the Mindful Eating Summit, the experts (of which I’m one) teach you how to boost your nutrition, end mindless overeating, and stop feeling guilty when you eat. You’ll have a chance to learn tools, strategies and techniques you can apply right now to eat healthier. Plus, you’ll discover the cutting edge science that is shaping the world of nutrition and how you can apply it right now. Margaret Floyd, author of Eat Naked. Dr. Daniel Siegel, Professor of at the UCLA School of Medicine and the founding co-director of the Mindful Awareness Research Center. Dr. Alan Christianson specializes in natural endocrinology with a focus on thyroid disorders. When you sign up for the Mindful Eating Summit, you’ll also receive a free ebook, The Emotional Eater’s Tool Kit, so you can start taking charge of your eating right now. The Mindful Eating Summit is presented by Susan Albers, Psy.D., a psychologist at the Cleveland Clinic who specializes in eating issues, weight loss, body image concerns and mindfulness. 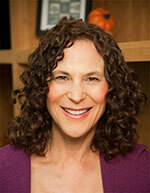 Dr. Albers conducts mindful eating workshops across the country. She is author of six books about mindful eating, including EatQ: Unlock the Weight-Loss Power of Emotional Intelligence and 50 Ways to Soothe Yourself Without Food. Catch all of our interviews now. Just sign up for the Mindful Eating Summit. What do a Bagel & a Candy Bar Have in Common? Ever wondered why we overeat? Do you or your loved ones overeat? Have you or your family members been gaining unwanted excess weight? Are you concerned about our obesity crisis? To gain insights into why two-thirds of us are getting fatter and sicker, I urge you to watch a video of this fascinating panel discussion, “Why We Overeat: The Toxic Food Environment & Obesity,” thanks to the Harvard School of Public Health and the Huffington Post. I came across this fabulous video while doing research for research for my next book, Crush Your Crazy Carb Cravings™. Plus, the “Why We Overeat” panel was moderated brilliantly by Meredith Melnick, Editorial Director for HuffPost Healthy Living. “Now sugar, I agree that sugar is a problem, but sugar is no greater a problem than totally unsweetened refined grains. And the worry I have about just focusing on sugar, it gives the refined grains, it gets them off the hook. Also, I invite you to keep watching to check out the second video (at 59:00) from the HBO film, Weight of the Nation, .where you can discover which beverages contain the most sugar content, thanks to The WATCH Nutrition Clinic. I’d love to hear what you think about this video. Watch the video here. (I had to take it down, because it would automatically play every time you came to my Sugar Shock Blog. Join the Conversation. What is your biggest Ahah! from this “Why We Overeat” video? Special thanks to www.NoGrainer.com for the artwork on this blog. Given that I’m on tight deadline for my next book, I didn’t verify that it was okay to use this artwork. So, if I posted this and shouldn’t have, please let me know, and I’ll be happy to take it down. Join the Crazy Cravings Conversation™. What foods do you most crave and when? Post your comment now. Do you find that whenever stress strikes, deadline hits, your kids misbehave or grief wallops you, you’re seized by absolutely urgent, overpowering Crazy Cravings™ for easily accessible, fiber-stripped carbohydrates or other sugary, salty, fatty foods? Then, the next thing you know, fueled by your frantic cravings, you hunt out your favorite trigger foods, which, of course, are quite easy to find. After all, unless we live in the boonies or the outbacks, we’re in the midst of a junk-food jungle, which is full of convenience stores, bakeries, and carts that sell a plethora of tempting donuts, candies, cookies, crackers, chips, and junk foods. What’s a wanna-be healthy eater to do? And what can you do if you want to lose weight and your cravings keep derailing you? Well, you need to learn to Calm Your Crazy Cravings™, as I put it. Lately, I’ve been wracking my brain and exhaustively researchng how to help you do just that. In fact, that’s why, as you may have noticed. I haven’t been posting as much lately on this Sugar Shock Blog or on my Huffington Post or Heal Your Life blogs. You see, I’ve been deep into writing and researching my third book, Calm Your Crazy Cravings (that’s the wokring title). My next book will help you finally let go of your urgent urges for unhealthy sugary, salty, fatty junk foods, or what I call nonfoods or unreal foods. 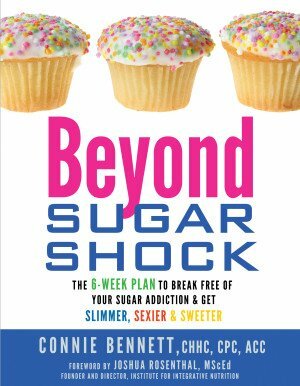 My next book, which I’ve been working on intensely for two years, while healing after the death of my mother, is the the follow up to my books, Sugar Shock and Beyond Sugar Shock. Although — as I mentioned in My Carb Confession here and then later here, when I thanked Sean Croxton for inspring me to come clean — the initial inspiration for this book grew out of my own challenging, traumatic experiences and Crazy Cravings, my next book can help millions, I believe, to rise about those incessant desires for unreal foods, which can lead you to disease and even an early death. Anyhow, I ask you to please be patient with me a while longer, because I’m sooooooo close to finishing my book, Calm Your Crazy Cravings, and then I’ll be posting lots of great tips for you. For now, I invite you to get excited! At last, you’ll get help to rise above your Crazy Cravings. In the meantime, I encourage you to get valuable perspective, awesome insights and wonderful help to understand and manage your cravings from my astute colleague, Alex Jamieson. The empowering, personable Alex Jamieson — who I had the pleasure of meeting years ago while living in New York City and who I saw recently at an awesome event for health experts presented by cutting-edge health guru JJ Virgin — is now gearing up for the publication of her next book, Women, Food and Desire, which comes out in January. In fact, you may have been one of millions, who had the pleasure of seeing her on such shows as “Oprah” or “The National Health Test with Bryant Gumbel” or in the award-winning documentary, Super Size Me. You also can hear her inspring TedX talk here. In fact, I’m honored to be able to present Alex as one of more than 20 experts, who will participate in my upcoming Sugar World Summit. Stay tuned for details. In the meantime, talk to us. Photo Credit: Please note that since I’m on book deadline, I haven’t resarched if it’s okay to use this artwork above. If not, please let me know and I’ll take it down. In the meantime, I want to profusely thank Clipart Vector for this awesome cartoon. Check them out. Diet check-up: Are you hooked on too much salt sugar and fat? Join the Conversation: Are you a “heavy user” of salty, sugary or fatty foods? Are you hooked on salty, sugary or fatty processed foods? If you wonder why certain packaged food products call out to you often, you must read the brilliant, eye-opening book, Salt, Sugar, Fat: How the Food Giants Hooked Us from Pulitzer Prize-winning Michael Moss, an investigatve reporter for The New York Times. Frankly, I’m in awe of Moss and his investigative prowess. Over a period of three-and-a-half years, he interviewed hundreds of industry insiders, who revealed jaw-dropping, inside information about what our favorite food companies do to land space on grocery store shelves, crush the competition, boost the bottom line, please Wall Street, and influence our buying habits so we can’t pass up on foods with salt, sugar and fat. For those of you, who find yourself frequently buying and eating certain processed chips, cookies or cereals, Moss sheds light on why this may be happening. The captivating processed food substances you find on supermarket shelves “are knowingly designed—engineered is the better word—to maximize their allure,” Moss writes. “Their packaging is tailored to excite our kids,” he continues. Indeed, those of you, who struggle to peel off pounds and hate that you can’t quit over-consuming your favorite sweet soft drinks, salty chips, or fatty cookies, you need to know that food scientists are actually using cutting-edge technology to calculate the “bliss point” and enhance the “mouthfeel” of your preferred foods so they’ll sell more, Moss explains. Perhaps one of the more scary revelations Moss makes in Salt, Sugar Fat is how the food industry regards its ardent customers. No, I’m not talking about drugs, but, in light of recent food addiction research, that shows how the brain lights up on sugar as it does on cocaine, the term “user” is certainly apt. And you wonder why your most intense, all-consuming, wild cravings for unnatural, packaged, sugary, salty, fatty foodstuffs swoop in on you often as if they were ravenous vultures waiting for their next dead prey to disembowel? Sorry for the gross imagery, but as a former sugar-addicted journalist, my goal is not only to educate you, but to help you become strong, alert, and determined to lift your choose-healthy-food muscles when you’re at your favorite supermarket, as well as at drug stores, movie theaters and even hospitals..
By the way, just as I was about to put this post up on this Sugar Shock Blog, I discovered — while catching up on Dr. Oz Show episodes — that yesterday, Moss was featured in an awesome episode, Supermarket Secrets: How They Fool You Into Buying Foods That Make You Fat. Watch The Dr. Oz Show episode with Moss now. With that in mind, it’s best to be prepared with “that shopping list, commit yourself to stick with it, shop when you’re full, shop with a clear mind,” Moss urges. Let Michael Moss open your eyes now by buying his intriguing book, Salt Sugar Fat: How the Food Giants Hooked Us.